AustCham Hosts "Australian Flavour Sundowner"
Mrs. Pilar Perez-McKay (2nd from left), executive director Australian Chamber of Commerce in Korea (AustCham), poses with Sundowner participants at the Grand InterContinental Hotel in Seoul's Samsung-dong on Nov. 27, 2009. "Australian Flavour Sundowner," a great Aussie-style event of social networking was held at Blush Bar of the Grand InterContinental Hotel in Samsung-dong, Seoul on Nov. 27, 2009. 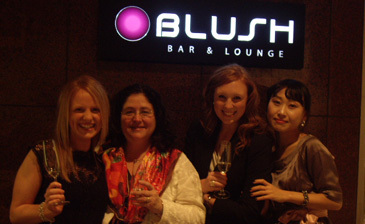 Blush Bar is a glamorous, sophisticated, and luxurious bar and lounge, a stylish place to hold this event. InterContinental’s Executive Chef Australian Nick Flynn had prepared an exciting buffet style menu of Australian inspired dishes such as prawn cocktails, grilled lamb cutlets, fish & chips, seared tuna with pickled ginger, rice paper rolls, Lamingtons, mini Pavlovas accompanied by fine wines and beer to help people feel nostalgic. Lamingtons, Australia’s traditional cake was one of the most popular desserts among people. It was a great opportunity for people who had missed this kind of excellent Australian cuisine to engage themselves in the mecca of Australian dishes. 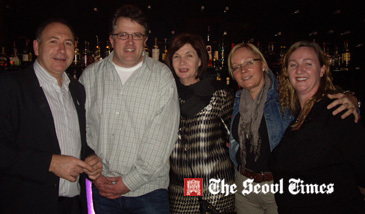 Members of the Australian Chamber of Commerce in Korea (AustCham) pose for The Seoul Times at "Sundowner" party. Those who wanted to hobnob with people and to have taste of home had a great time throughout the event at the Australian buffet dinner. Those who wanted to meet new people and expand their business relationship had also wonderful moments. The event was so well organized that people could easily mingle with others, helping new settlers in Korea to learn the ways of life in Korea and businesspeople to share useful information and network one another. Excitingly enough, the luck shines upon a few people who won the awesome lucky draw prizes. Prizes included dinner tickets at Grand InterContinental Hotel, stays in InterContinental Hotel in Hanoi, Vietnam, and Chanel the cosmetics. The prizes boosted already great ambience to the festive mood and attendees — of course, the winners in particular — were overjoyed. All through the party, the attendees conversed over various topics ranging from Green energy, transportation, traveling to local and global politics. Amongst all, the impact of culture on business and on the everyday life caught people’s attention because the culture really has influence on business as well as everyday life. It was sponsored by the Australian Chamber of Commerce in Korea (AustCham). One of the attendees, who moved to Seoul four weeks ago, said “It is great of AustCham to organize such an event. This gave me an opportunity to meet fellow Australians.” Greg, an Australian businessman, said “This is a great and wonderful opportunity to meet people in Korea.” This month’s event assured the attendees to build nice and productive relationship between Koreans and Australians. The event was so successful that attendees promised to see each other again in Australian Chamber and have a bigger social gathering for next month’s Sundowner event.